Springtime means Easter, and there are lots of Easter events in Ludington, Scottville, Manistee, Pentwater, and the surrounding areas that give kids a chance to celebrate! Non-profit organizations and businesses provide children with fun, wholesome, indoor and outdoor Easter activities to help beat the blahs of the winter to spring transition. From visits with the Easter bunny to an egg scramble on roller skates, there's lots of fun activities for kids of all ages! Below are Easter events from 2019. Saturday, April 13th, 12-4pm - Selfies with Hopkins the Easter Bunny at Walmart- 4854 W. US 10 in Ludington. Saturday, April 13th, 1-2:30pm - Easter for Kids at Redeemer Lutheran Church- 509 N. Main St. in Scottville. All children are welcome and the event includes an Easter devotion, egg-coloring, craft, cookie decorating, and egg hunt. Saturday, April 13th, 1-3pm - Pictures with the Easter Bunny at Krave- 103 E. Ludington Ave. in Ludington. Saturday, April 20th, 10:30-11:30am - Easter Eggstravaganza at St. John's Lutheran Church- 209 N. Rowe in Ludington. The event includes a FREE Egg hunt, candy, snacks, bubble pool, and music. Saturday, April 20th, 12-4pm - Selfies with Hopkins the Easter Bunny at Walmart- 4854 W. US 10 in Ludington. 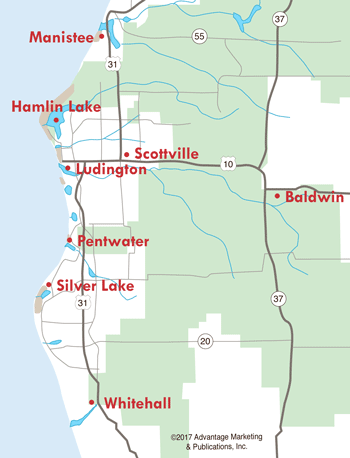 Saturday, April 20th, 1pm - Ludington Area Jaycees Annual Easter Egg Hunt at Peter Copeyon Park on South Washington Avenue in Ludington. Approximately 6,000 total eggs stuffed with candy, toys, etc. are out in a simultaneous hunt between these age groups: 4 and Under, 5-8, and 9-13. Two lucky kids in each age group will find a "golden ticket" which they'll turn in for a special prize! Please bring bags and plan to return emptied eggs to the Jaycees after the hunt. Sunday, April 21st, 8:15-10:30am - Easter breakfast served by the youth group at Our Savior Lutheran Church- 765 US 10 in Scottville. Sunday, April 21st, 12-4pm - Selfies with Hopkins the Easter Bunny at Walmart- 4854 W. US 10 in Ludington. Sunday, April 7th, 11:30am-12:30pm - Easter Egg Scramble at Johnny's Skate Center, 2276 US 10 in Custer. Free admission. For kids age 10 and younger. Thousands of eggs filled with prizes. Saturday, April 13th, 2-4pm - Easter Egg Hunt at Custer VFW Gold Bar Post #5096- 2022 State St. in Custer. Free and open to children age 1-12. Crafts, prizes, and pictures with the Easter Bunny! Saturday, April 20th, 11am-2pm - Community Easter Egg Hunt at Trinity Lutheran Church- 5631 W. Stony Lake Dr. in New Era. Activities, egg hunt, and free lunch. Open the public. Saturday, April 20th, 12pm - Annual Easter on the Green on the Village Green - 327 S. Hancock St., Pentwater. Sponsored by The Antler Bar and the Pentwater Chamber of Commerce. Meet the Easter Bunny, Easter Egg Hunt, Easter Bonnet parade and contest, musical chairs, face painting, and games. Saturday, April 20th, 12-3pm - Hart Easter Egg Hunt at Oceana County Fairgrounds, Hart. Saturday, April 20th, 1pm - Manistee Jaycees Easter Hunt at Jefferson Elementary School- 550 Maple St. in Manistee. Children 12 and under are welcome to the hunt and to visit with the Easter Bunny. Kids are asked to bring a basket for their eggs and be prepared for muddy conditions. Sunday, April 21 - Easter Egg Hunt Celebration at the Manistee United Methodist Church. Egg Hunts and Easter Fun, 10-11am; event giveaways and hands-on fun for families, 11am-noon.